This year’s Bloomberg New Contemporaries features the work of 46 students and recent graduates from UK art schools. Ranging from minimalist purism to a giant 'fish finger', it provides a snapshot of current work that delights and bemuses. Works by 46 of the most talented students and recent graduates from UK art schools were unveiled this weekend as the latest edition of Bloomberg New Contemporaries opened at Bristol’s Spike Island. Held annually in various guises since 1949, the prestigious event offers important recognition and essential support to artists just starting out. This year’s selection is a veritable cornucopia of dynamic new art in which painting, sculpture, video, animation, drawing, and photography all vie for attention. The exhibition is a testament to the health of our nation’s art schools, which evidently remain fertile hotbeds of innovation and experimentation. It is also thoroughly international, including artists from Pakistan, Australia, South Africa, Italy, the US, and the UK. With over 1,500 applications to sift through, selectors Ryan Gander, Chantal Joffe and Nathaniel Mellors had their work cut out. As usual, the artworks were chosen anonymously without any knowledge of school, age or gender. It’s an approach that Sacha Craddock, chair of New Contemporaries, likens to blind tasting. “It allows a sense that what gets through has been intensely revisited and discussed,” she says. It’s certainly a show of contrasts. 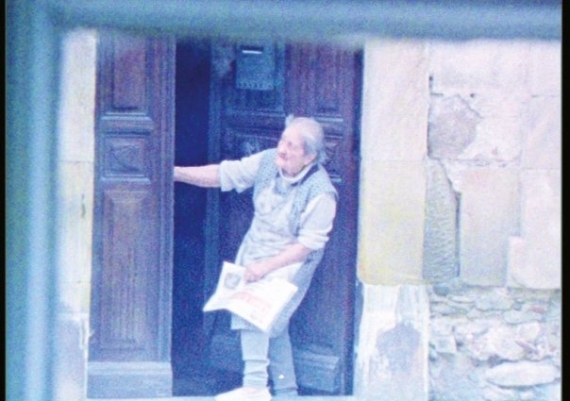 An old lady peers out from behind a large wooden door in Shelley Theodore’s delightful short film, Madame Boussieux Looks. This quiet, observational piece couldn’t be further removed from the high-pitched ramblings of the neurotic pink-haired troll in Adam Hogarth’s video, Trolling. There’s something uncanny about Joanna Piotrowska’s large black and white photographs of impassive couples. 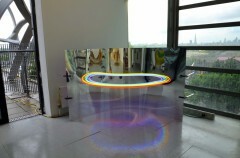 Her austere works demand contemplation, unlike the exhilarating eye candy of Steven Morgana’s neon rainbow, that delivers an instant visual hit. 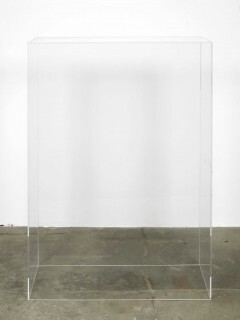 Yves Scherer’s pristine perspex container injects a touch of minimalist purism into the show. Her empty, transparent sculpture clashes with the fastidious detail of Marlene Steyn’s painting, An Island for Mouth Sharing, which is covered with hundreds of ominous eyeballs. 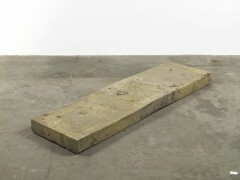 Alexandra McNamee’s grubby looking sculpture, Fish Finger, is made from a large slab of foam covered in clay. Its friable surface is intriguing but, curiously, resembles nothing like breaded fish. On a far grander scale is Julia Parkinson’s enormous steel sculpture, In Conversation. Dominating the space with a self-assured presence, this ambitious, industrial-scale work demonstrates the artist’s love of materials. The materiality of paint also seems important this year, with a number of artists slathering on the oils to create rich impasto surfaces verging on the sculptural. Among them is Archie Franks, whose claustrophobic canvas, Fishtank, depicts three fish with nowhere to go. Painting is simultaneously deconstructed and reconstructed in Daniela Sarigu’s woven canvas, whose tactile appeal is hard to resist. Spike Island previously hosted New Contemporaries in 2005, but this is the first year the exhibition has premiered at the gallery. Its director, Helen Legg, says: “Our organisation is built on a commitment to support and develop emerging artists, so presenting Bloomberg New Contemporaries is a fantastic opportunity for us. This is especially important at a moment in which the conditions for artists become increasingly difficult, with the increase of university fees, cuts across the arts sector and the rising cost of studio spaces.” Key works from the exhibition are also on display at an additional city centre venue, 8 Millennium Promenade, just a short boat trip away from Spike Island. New Contemporaries does not claim to offer a definitive statement about the future of art. Rather, it presents a snapshot of current emerging practice; a snapshot that delights, unsettles and bemuses.